Thanks to everyone who voted for iSchoolgreen!! Hoorah We Really Did It!! 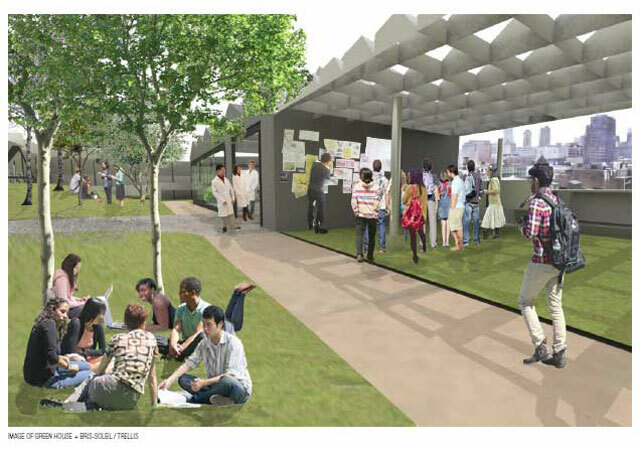 The Green Roof Project has won a $10,000 grant from the Seeds of Change – Share the Good competition. You can see the announcement on Facebook at www.SharetheGoodGrant.com or read the press release in the Wall Street Journal at http://online.wsj.com/article/PR-CO-20130604-905180.html Wait until you see what we grow! New York City High School Students have designed an ecologically and educationally excellent Green Roof for our historic school building. More than 300 students have worked on the project for four years. Now we are going to build it – and we will be needing everyone’s help and support. 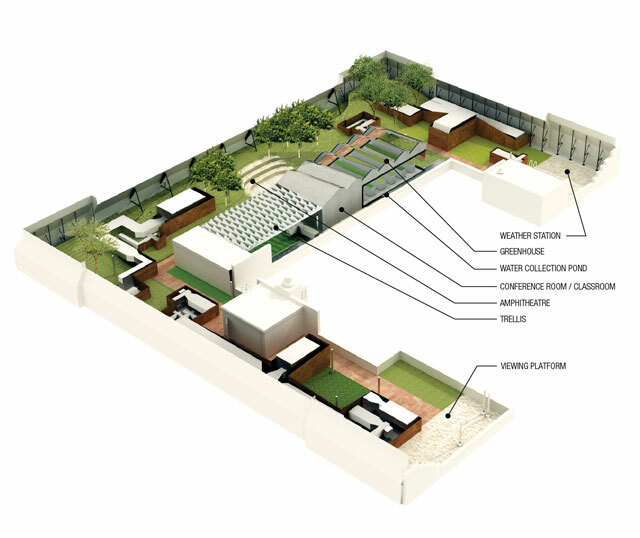 Here is our preliminary site design, created in collaboration with the Green Roof Team, Demetrios Comodromos and Reese Campbell, principal architects of Method Design. A matrix organization illustration lends itself for multiple arrays of native vegetation, for categorizing species and staging a variety of activities. 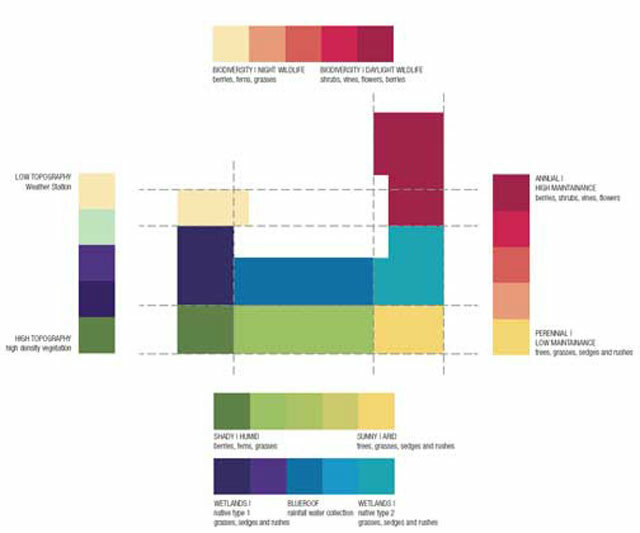 A Gradient illustration utilizes ecological differences that reflect species variances and similarities, a landscape of blendings and interpolations in given native landscapes, taking the shapes and colors of the plants on display. In this scheme, a simple matrix is setup with one set of categories defined by plant typology and growth height, and the other with ground/green roof typology. The intersections that form each ’zone’ of this matrix create a patchwork of different environments that address a full range of possible growing conditions, plant species differentiation, housing of animal biodiversity, and variation in spaces for the use of students and faculty. 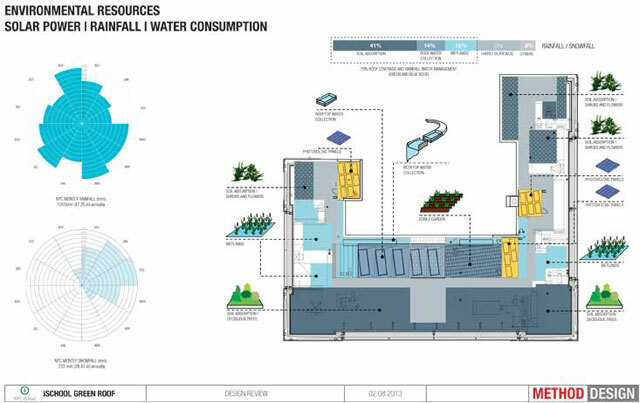 The Greenhouse is the primary interior space, with a classroom/conference room component. This directly relates to the exterior meeting space with a specially designed trellis composed of specially calibrated light ‘foils’ that selectively shade and project occupants from glare. 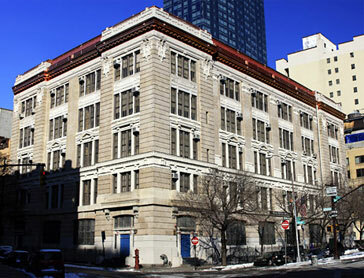 Founded in 2008, the NYC iSchool is the first school opened under the New York City Department of Education’s 21st Century Schools Initiative. Its innovative curriculum has served as a model for the 400 schools currently part of the DOE’s I (Innovation) –Zone. An essential component of that curriculum is that students learn best when solving real world problems. 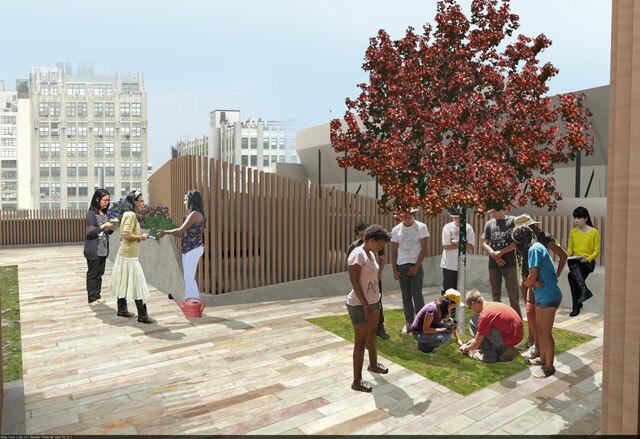 The mission of the NYC iSchool’s Green Roof Project is to provide students with the opportunity to engage in meaningful and real-world interdisciplinary problem-solving through which they learn valuable skills while also impacting their community. Working on the Green Roof Project students are developing 21st-century-skills, are engaged in solving real-world challenges and are empowered to make a difference. 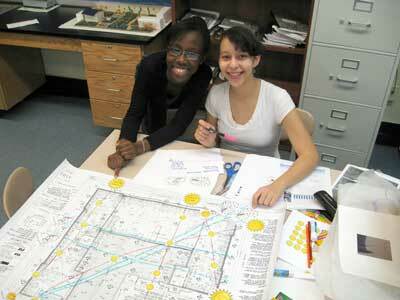 Students work collaboratively with experts in architecture, engineering, environmental science, and public policy. 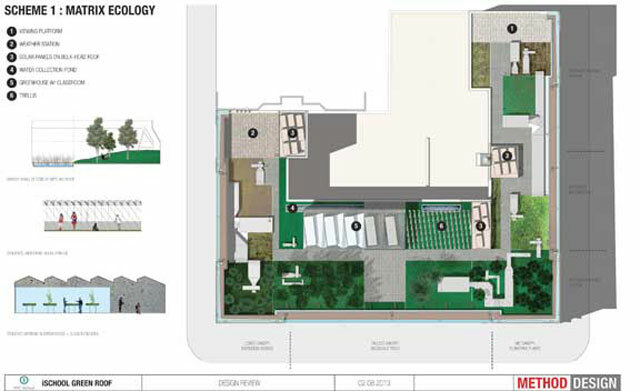 They design and communicate their understanding of the environmental and educational benefits of a green roof landscape and environmental learning center on the roof of our historic building. Awards and media coverage of the Green Roof Project have acknowledged its innovative spirit and seriousness of purpose. 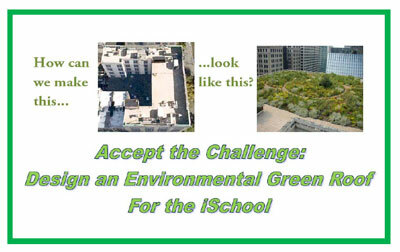 Teams of iSchool students have studied, designed, and promoted the idea of an ecological green roof for our building. The 12,000 square foot green roof would contain both extensive and intensive planting including a meadow, perennial garden and food growing areas. 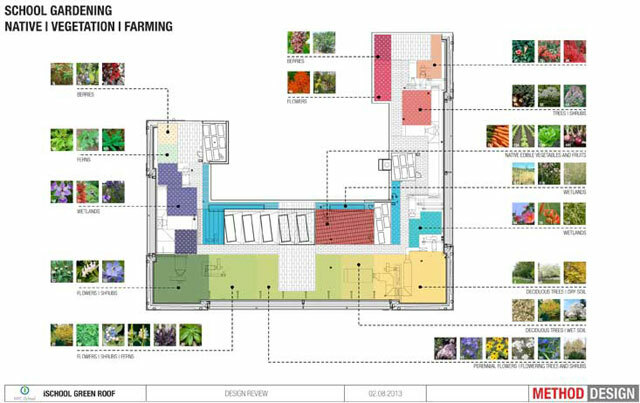 We also have plans for a totally green environmental classroom along with a scientific condition monitoring system and alternative energy demonstration projects. Environmentally, the green roof would reduce the building’s carbon footprint, reduce polluting storm water runoff , and restore native habitat. Educationally, it would support the iSchool’s goals of developing creative, problem-solving leaders in sustainable living and design. Engineers and architects from a local company have†been mentoring the students and have offered to complete a pro bono feasibility study for the project. In the longer term, we†are in the process of seeking support for the architectural plans and installation of the green roof. We think that our green roof will be the first large green roof project in New York City in which the students are involved in all phases, and in which the planning, building, maintenance, and educational use of the green roof are completely integrated into the school’s educational goals. 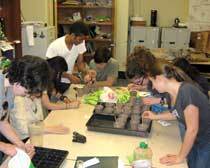 Planting the first GreenRoof seeds. New iSchool Weather Station Installed On the Roof! 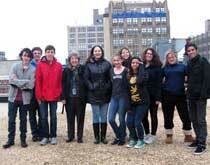 Green Roof Team Recruits New Freshman Members!